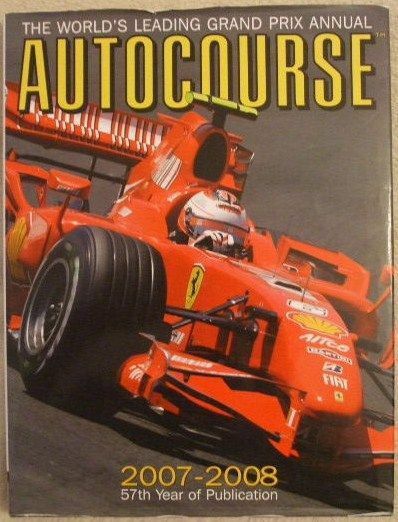 First edition, first print hardback of AUTOCOURSE 2007-2008 GRAND PRIX ANNUAL: 57th Year of Publication of the World's Leading Grand Prix Annual. Edited by Alan Henry. Foreword by the 2007 world champion Kimi Raikkonen and published by Crash Media Group Ltd., Northants in 2007. The book is in very good condition (Clean green cloth boards and gilt lettering on the spine) with some wear to the pictorial dust jacket which is not price clipped (creasing/ curling to edges and minor rubbing to the corners). Internally, the pages are clean and tight and there are no tears and no inscriptions. AUTOCOURSE annuals cover a long period of the sport's history, from 1951 to the present day, and, as such, are highly collectible. The first edition of AUTOCOURSE appeared in 1951, as a quarterly review of motorsport. Its aims were to "to provide the most complete data obtainable with interesting and authentic information, settle arguments and provide countless hours of interesting study and amusement. Alan Henry is the motorsport correspondent for the Guardian newspaper and has been the editor of Autocourse for the past 21 years. He has written many biographies of the sport's finest practitioners, including Ayrton Senna, Niki Lauda and Jochen Rind. "The 2007 FIA Formula 1 World Championship turned out to be a unique contest, full of colour, controversy and intrigue, fought out over a 17-race schedule in which the outcome of the drivers' championship battle hung in the balance right up to the final lap of the final lap race of the season. In the end it was Finnish Ferrari star Kimi Raikkonen who claimed the title by a point over the McLaren Mercedes duo Lewis Hamilton and Fernando Alonso after a season-long battle of dramatically changing fortunes. AUTOCOURSE 2007-2008 offers the most detailed, penetrating and analytical assessment of what unfolded as a rollercoaster season fought out by two of the most famous teams in Formula 1 history - Ferrari and McLaren. Packed with stunning colour photographs and bristling with data and statistics, this edition of the most famous and long-lived F1 annual highlights the emergence of Lewis Hamilton as the most exciting young British talent in a generation, how he came within an ace of becoming the sport's first rookie world champion and still won four of the season's races, the intra-team challenge from his new colleague - the double world champion Alonso - and a revitalised Raikkonen, who posted six wins in his new role as Michael Schumacher's successor at Ferrari. Supporting rounded and complete coverage of the F1 world championship is a comprehensive analysis of all the key supporting categories on the international racing scene. These include the traditionally wide-ranging AUTOCOURSE US racing review, coverage of the key GP2 feeder formula that spawned Lewis Hamilton in 2006 ans a sports car review highlighting the Audi-versus-Peugeot diesel battle at Le Mans - and detailed assessments of F3, touring cars and the split- second world karting's rising stars round off the most comprehensive and complete record of international motor sport." 336 pages. Illustrated with many full page colour and black & white photographs throughout.